Here at Battery Power, we want to meet all of your battery needs when it comes to your golf cart. We carry all major brands of batteries including Trojan, Deka, Global, US Battery and our own Battery Power brand. We provide a full and professional installation service if needed. Onsite at your location or you can bring the cart to us. Batteries replaced and proper recycling of old ones. Battery frame will be cleaned to remove any excess debris and corrosion. Battery cables cleaned to provide a proper connection. Terminal anti-corrosion spray used to reduce future corrosion build-up. Cart lights will be checked for proper operation. Tire pressure checked and adjusted. Charger checked for proper operation. 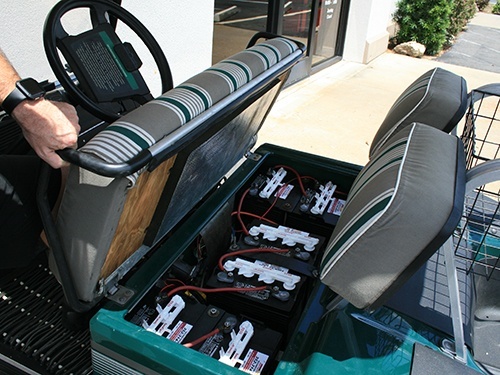 If you need golf cart battery installation services, please reach out to us at Battery Power at 352-314-9001 or use our online contact form for assistance.